I got a shoutout! Glad the feedback was useful. The controls are mighty solid now, I really feel in control! Thanks for fixing it, but F9 wasn't obvious to me at all. It might be good to go with "lock the mouse cursor into the game area on click" and unlock it when [pressing escape] / [losing focus] / [entering a menu (once you have those)]. Hmm, guess I didn't quite explain it well enough. Try jumping in this spot. What happens is that you can't get higher than this, and then you're suspended in that spot for a bit, and then you land back down. What I'm guessing what happens here is that Keen "completes" his jump while the obstruction is blocking him. What should happen is that the jump should be aborted and he should start falling as soon as his head hits the obstruction. The hitbox of that ceiling should probably be adjusted a bit too. And the hitbox for that rock he's standing on could be adjusted a bit too. Or maybe Keen's own hitbox is a bit too large on the top and bottom? There's an errant polygon in Keen's shirt that's going all over the place, but since you're replacing the model I suppose that's a moot point. You also might want to turn this hole into an actual deep hole, so it won't look weird like that on the sides. As for getting back out, you could just make the bottom of the hole warp you to a safe position for now. So yeah, nice work with this new version, and good luck with the next one! And if I can help with sound or music, please let me know. I like. The movement doesn't quite feel smooth, and I might suggest making Keen move a little faster, but it seems like a good port. GoldenRishi wrote: I like. The movement doesn't quite feel smooth, and I might suggest making Keen move a little faster, but it seems like a good port. Ok, would you say that the first release plays smoother, compared with the second, even though the first makes it harder to "platform"? chrissifniotis wrote: Wow, someone listened to me. Never had that happen before. Also, thanks for letting me know things have improved. Some of the best feedback is when you listen to someone's suggestion and they let you know you made things better! wiivn wrote: That's like the coolest idea! Do it!!! haha, maybe for an april fool's day prank? VikingBoyBilly wrote: Idunno, I just downloaded Unity a week ago and need something to play with. ahh, ok...well I can always send you some graphics if you want to tinker with that. I'll definitely let you know if I'm accepting help for this and if I do anything that's in 3D, after Keen64? I'd like that to be more of a group project. DaVince wrote: I got a shoutout! Glad the feedback was useful. The controls are mighty solid now, I really feel in control! Yeah, thanks for thoughtfully going through the game and telling me what you think should change. You can go two ways with this: emulate the slightly slippery controls like in Keen 1-3, or go with the immediate walk-stop- movements in Keen 4-6. Either way, when you're in the air, you should always be able to turn into a different direction. You always could in any of the original games; this is what gives the game a lot more control. Pogo controls were the most tricky in the Keen games. Since 3D controls are more difficult to handle, be careful you don't make these TOO difficult. Oh! Also, another point of feedback: add a shadow on the floor below Keen! 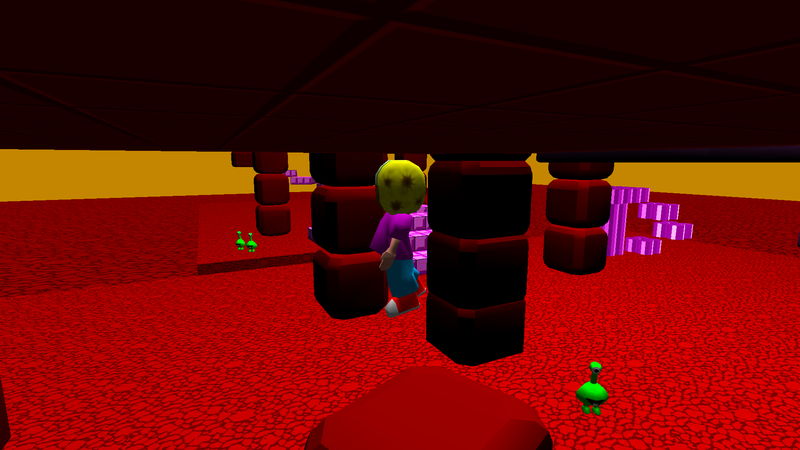 This makes platforming a lot better as you can properly tell where you're going to land. Ok, here is release 3. I actually decided to spend most of this release responding to feedback. Then last minute I added some extra items. Thankfully, when I was starting to write this into the game myself, I found another Unity template script that had this built in. He also no longer sticks to the ceiling, like in the other script. Again, I can't claim any credit for this. That script I found in Unity did most of this already. Now, since I am using a different script, I had to rework some of the parameters for Keen's gameplay-- such as jump height, run speed, etc, so if anyone thinks there could be some adjustments, please let me know and I will consider them. You can still see the floor on that one platform, when standing on the blocks and jumping. But this doesn't happen by just moving the camera around. The other problem with this, is that when you click, Keen shoots. So I will have to think of a solution in the future. But for now, since the web version does require you to click on the screen before you can lock it, I might as well just roll with that. It should be noted that the sensitivity only changes the horizontal rotation speed, to address the immediate complaint. But I will eventually add an options screen and allow you to change the vertical sensitivity, as well. Even though I would like have a "stats page" done in the style of Keen 1, for now I thought it would be rewarding for the player to see their score. Also, with no options screen (yet), adjusting the mouse sensitivity is pointless without an indicator of what it actually is. When I add ammo, it will probably go below the score text, until I can get the stats page going. I will eventually add an animation to their "death sequence", like the Pogo demo had; but for now, they just sink into the ground and stop moving (now, if they were turning prior to being shot, they might keep spinning...but I will fix that when I actually give them more detailed behavior). If anyone thinks this looks too fancy for a game trying to capture the feel of an N64 game, I can easily turn off all other shadows, besides the one under Keen. 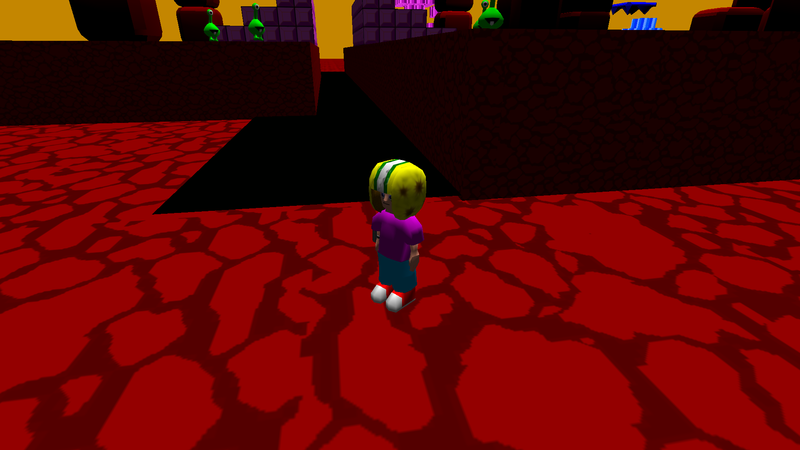 I feel the lollipops now look straight out of the original game, while also keeping that low poly look. Adding the wall actually began as a collider to stop bullets from heading off into infinity (and slowing down the game if you make a jazillion of them). Then I thought it would be more fitting to not let the player go too far, otherwise a bullet might get through a gap in the collider. The gun can be easily added, but I didn't bother since I was already planning to give everyone unlimited ammo so I could get feedback on how well bullets fly and are easy to shoot. This came as a result of using Unity's built in animation manager. I'm really happy with the way it came out. NEXT: Collectable ammo, better Yorp behavior and dying! Last edited by Lava89 on Tue May 09, 2017 21:02, edited 1 time in total. Nice work! I'll have to wait until I'm in Linux since Unity Web Player no longer works on Chrome in Windows, but it's looking promising. Works very well in openSUSE. Wrapping my head around 3D Martian gravity is difficult but that's just me, not the name. 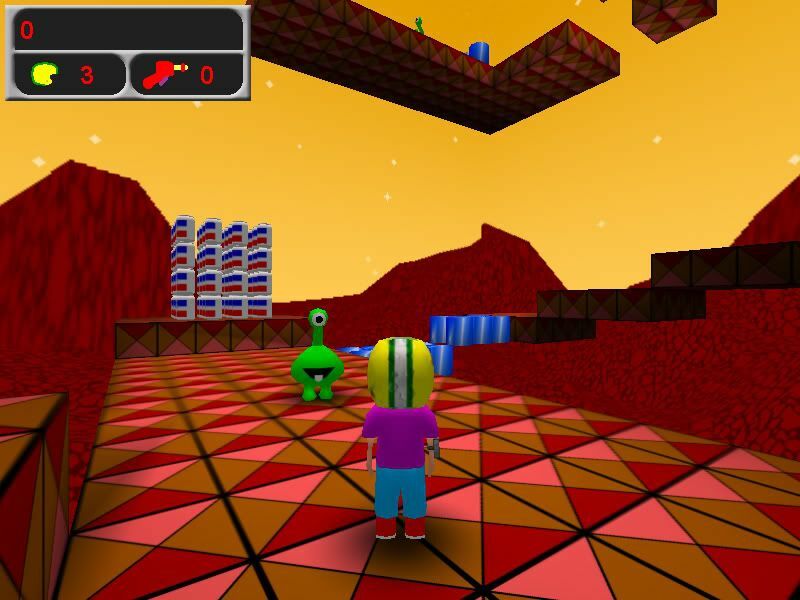 The game is good and you've realised the levels in 3D well. I'm sure aware, but when you improve the Yorp behaviour you need to adjust the creatures' bounding box - Keen can stand on air if he lands on them. Also, something to consider: I appreciate you are sticking to the original look as much as you can in 3D, but the exit portal is a bit lacklustre thanks to its history. In 2D, it looked a bit more like a teleporter than it does in 3D - I think you could be forgiven for some creative re-imagining. Core gameplay is good! It's a little bit floaty - it takes a very short moment for Keen to "lift off the ground", which is an action that would feel better if it's instant, but I feel like I'm in control. Platforming feels challenging, yet doable. The most prominent things lacking right now are obviously stuff like death, or the environment around the levels (I think you can remove that lowered red plane altogether or make it instakill or something). Oh, and sound. Some of the game's reactions to your actions feel too subtle, or have no feedback whatsoever yet. Of course, a lot of this will be polish that you'd only have to worry about later on, but I will mention them anyway because strong, immediate feedback and obvious, visible repercussions to your actions are one of the big things that make games all the more fun. Example: I couldn't tell the Yorps got stunned because their fainting animation was hardly noticeable and slow/graduate. Carefully observe what actually happens in Keen 1: when they're ZOT'd, they make a sudden jump in the air, there's a special zappy sound effect, and when they land back on the floor they look obviously, er, dead, I suppose. There's immediate and obvious feedback. Obtaining stuff has a similar sort of process in many 3D platformers: pick up a coin and there will be a sound AND visual cue. This is the kind of thing to pay attention to to make the game feel alive, I believe. Keening_Product wrote: The game is good and you've realised the levels in 3D well. I'm sure aware, but when you improve the Yorp behaviour you need to adjust the creatures' bounding box - Keen can stand on air if he lands on them. Thanks!! I'll take note of that. haha, well I've actually been thinking of changing the exit to look more like it did in the original game. In the original game, the exit was a blue door frame sticking out of the wall (I looked over every level to confirm this) and technically the level is supposed to be surrounded by a dome. My exit is basically a big box...floating in the middle of nowhere. Also, the original seemed have a bit of a curve to it (like a movie theater exit). While mine is just a straight hallway. 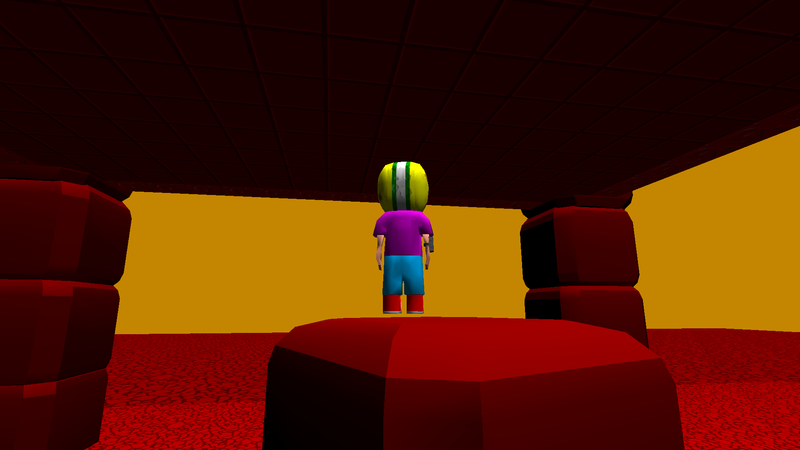 So I do plan add domes to the levels and I'll do some experimenting with the look. If not, I could just make it look more like a teleporter, as you suggested. Thanks! DaVince wrote: Core gameplay is good! It's a little bit floaty - it takes a very short moment for Keen to "lift off the ground", which is an action that would feel better if it's instant, but I feel like I'm in control. Platforming feels challenging, yet doable. Ok, well, I'd like the platforming to be as intuitive as possible. Though if it's challenging from a level design perspective and not out of poor gameplay mechanics, I guess I would consider that the "good" kind of challenging. You said it was a little floaty, so I started experimenting with Keen's parameters, and it seems increasing the gravity fixes that. But I only increased it a little, because it leaves less time to react during each jump. If that doesn't help, I'll alter his vertical speed directly. Eh, I think I'll leave the plane for now, until I can the level surrounded by mountains...like the Pogo demo had and put a dome around it. "I will eventually add an animation to their "death sequence", like the Pogo demo had; but for now, they just sink into the ground and stop moving"
DaVince wrote: Obtaining stuff has a similar sort of process in many 3D platformers: pick up a coin and there will be a sound AND visual cue. Well sound (as well as music) was in the Keen 64 Pogo demo, so eventually it will be in this version. Honestly, it's not something I will worry about until I can get at least two more, fully functioning levels. But the visual cue is a good idea, and something I didn't think of doing before. I have a few ideas for what that will look like, which I will experiment with in a future release. Thanks! haha....well, I think it's the result of the trickled release. After I get two more levels out, that are fully functioning, I'll see if I can release more without feeling the need to show every little thing and get feedback on it. Thanks again for the feedback! Honestly, it's not something I will worry about until I can get at least two more, fully functioning levels. Excellent! This was secretly the next thing I was hoping for the most. Play via Browser, standalone Windows. or standalone Linux. I will admit that there aren't a whole lot of major changes. My main goal was to bring back this project into relevance and get the ball rolling again (hence version number 3.5). I also migrated the project from Unity3D Version 4 to Unity 5, and I found that not everything translated over well right away. So after fixing things to the way they were, I want to make sure everyone is on the same page and I've heard a few in the community request that I make sure gameplay is solid before really pushing forward with new content. So again, my main purpose of these early builds to really ask the question, how does it play? Then after I try out a few more gameplay mechanics, such as the Pogo, etc-- I will make more levels without needing so much "hand holding" from the community. Sensitivity only changes the horizontal rotation speed, to address an immediate complaint. But I will eventually add an options screen and allow you to change the vertical sensitivity, as well. -Web version requires you to click on the screen before you can lock it. You may also not be able to see the entire GUI on the screen unless you click "full-screen". Eventually there will be a "stats page" done in the style of Keen 1 and probably a corner GUI like in Keen 4-6, but for now I thought it would be rewarding for the player to see their score. Also, with no options screen (yet), adjusting the mouse sensitivity is pointless without an indicator of what it actually is. Also, the web version has a weird font, but this is due to the fact that I can't use dropbox to "view" my HTML files, that plays the browser game and had to use an outside "HTML" viewer for GitHub pages (which is where I will be migrating my web content to, actually). But there is NO animation for their "death sequence" (YET)-- for now, they just stop moving (now, if they were turning prior to being shot, they might keep spinning...but I will fix that when I actually give them more detailed behavior). And it is displayed with score and sensitivity. I have made an update to the Exit, after Keening Product mentioned it. There are some issues with the shader that I will have to fix. For instance, once you get close to the Exit, the masking walls show as solid, yellow blocks (same color as the background). But down the road I'd like them to be completely invisible. Lastly, all of the links and images are broken from the previous builds due to Dropbox changing public file sharing policy.I'll probably leave the links the way they are (assuming that this new release is well accepted, haha-- I'll just move on) but I might upload the images from previous builds in the future. Last edited by Lava89 on Tue May 09, 2017 19:40, edited 1 time in total. There's supposed to be more than just floating lollipops, right? I'm using the Windows build on a 32-bit machine. It seems mostly normal, it's not giving me any error messages or anything. The textures just don't seem to be showing up. Whoa! Yeah, there should be platforms and stuff, like the pics show. Also, the fact that only the lollipops show up and gun sign is really bizarre. First of all, were you able to play the web version? If you're able to play that, could you please post a screen of that looks like? Thanks! I just tried the game on my laptop (it's a ThinkPad T420, so nothing fancy), by just playing the web and windows builds from the links I posted on here and they worked fine. So I am wondering if it's that masking shader I've been using for the exit, run amok, which would make the most sense, since it's supposed to hide meshes...which is what it seems to be doing for you. So the second piece of info I need is: were you able to move around in the game, despite having mostly everything invisible? To test out what I mean, when the game starts, try moving the mouse around or press "W", to see if anything moves. Also, please tell me if you seem to be falling at the start of the game-- because that would imply that the ground is not only visually invisible, it's completely disabled. If that shader is the issue, I might just disable it and slap together a quick build for you to try. Lastly, I believe the Windows version allows you to select a graphics setting, what did you choose for that? Sorry for all of the questions! It might take some work to narrow down the issue (which I'm totally up for, over PM's, if it persists). Plus, I'm really curious if anyone else is having this issue. So thanks for giving this a shot! I could move around and control the camera, and in fact everything besides the textures seemed so normal I started to wonder if it really was a glitch or just a very limited demo. No, I wasn't falling. The platforms are there, they're just invisible. Walking around a bit I sometimes run into a wall, and with some careful guessing I can even jump onto some higher platforms. I first used the "Fast" graphical detail setting at 1024x600 resolution, and after first seeing the glitch I tried setting it to "Fantastic" but it still didn't work. I also tested 640x400 windowed, and later tried all the detail settings but they all have the same problem. About the web version, my computer evidently isn't capable of doing anything high-processing while being online, which is exactly what this is trying to do. I tried it several times and it crashed every time, but that's entirely my computer's fault. Is this happening to anyone else, or is my computer just wierd?